 Located at Creative Village in Worksop, within the town center, quality one-to-one lessons, group tuition & workshops are conducted in a relaxed environment by a professional guitarist/drummer/producer and educator, endorsed by several of the world's biggest and most famous musical instrument companies including - ddrum, Ernie Ball, Music Man Guitars, Orange Amplification, Xotic Effects, Bare Knuckle Pickups, Rotosound and many more. Thirty-plus years of experience, all ages, abilities and musical styles welcome and catered for. 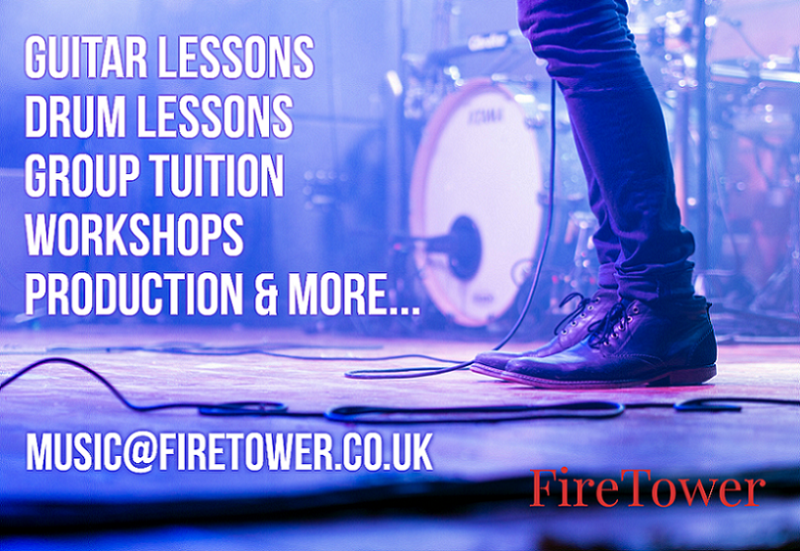 Sales, professional guitar setups, re-strings and drum re-heading/tuning available. Students have the option of accessing examinations via the Rockschool and Trinity Rock & Pop examining boards. Take a look around the site at what's going on and please get in touch if you have any further questions. We are a recording studio in Worksop. We also have a recording studio in Retford too. Get in touch to find out more. 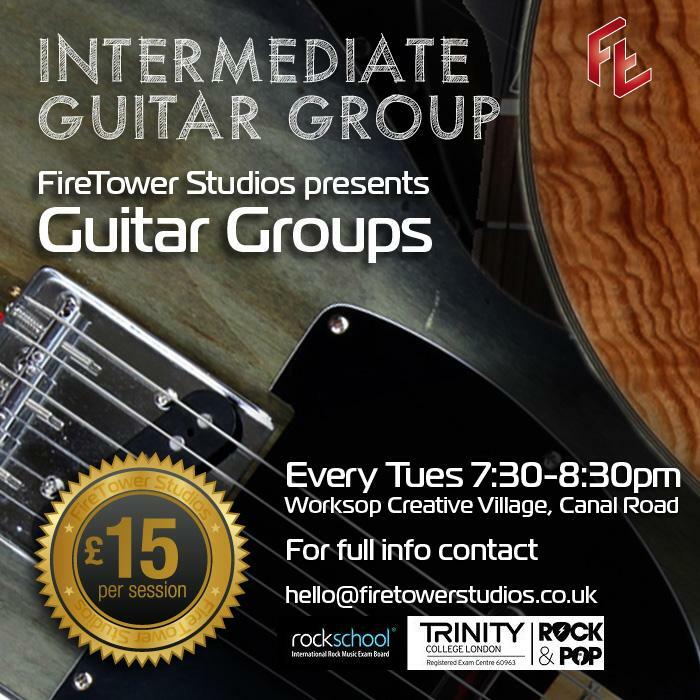 Like the 'Intermediate Guitar Group', if you know a few chords or can play a few notes on your chosen instrument - or you are fully competent - then group learning is a great way to push the boundaries of your musical knowledge. Open to all musician of all instrument types. Group learning will apply a different scale each week to learn. The scale will them be played over different styles and genres, tempos, rhythms and key positions. Depending on whether a drummer is in the group or not will dictate whether we will be playing to backing tracks, click tracks or group jams. 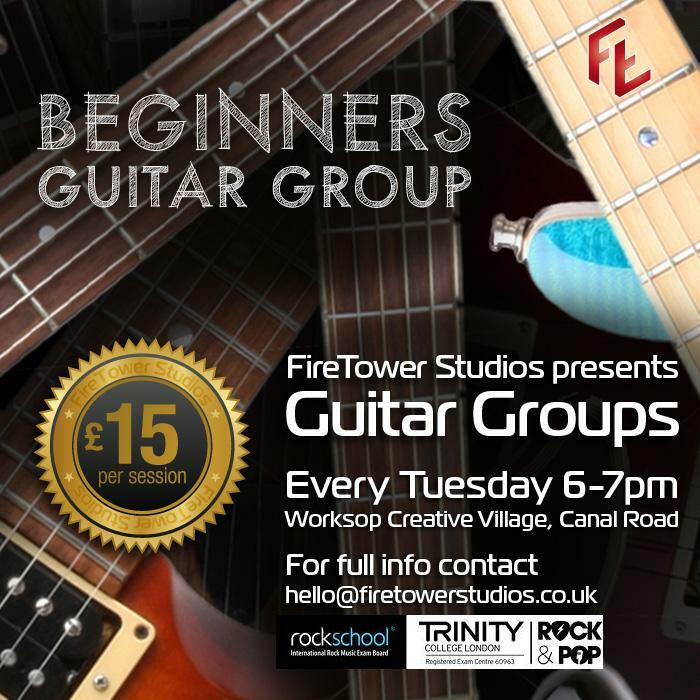 If you are a complete beginner to learning guitar then this is the group for you. By learning in a group you will develop your timekeeping and rhythm skills very quickly.  This course will start from the beginning including tuning, open chords, bar chords... all the way through to scales. If you know a few chords and are comfortable with the guitar, all the way through to confident lead guitarists, then this is the group for you. 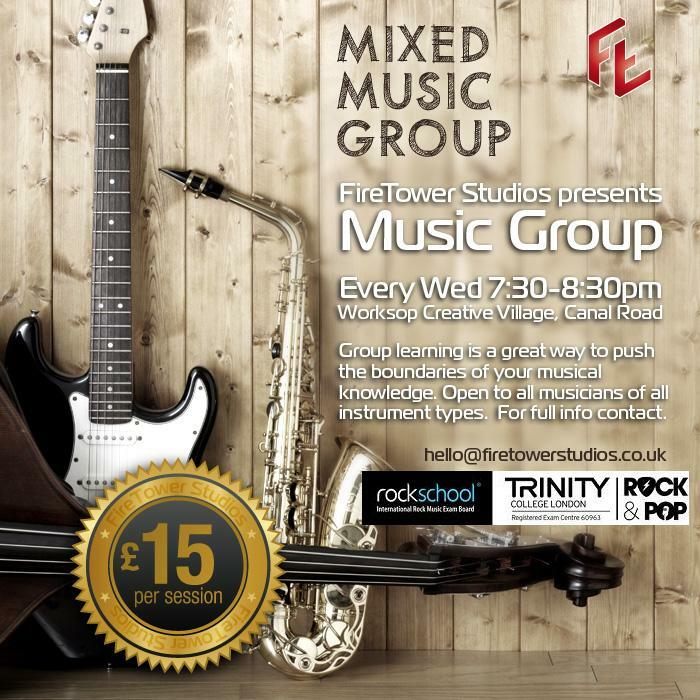 By group learning you will be playing to different rhythms, in differing keys, varying in scales types for each session. The course will vary the scale type each week, pushing the musician's skills through varying music styles, genre and tempos. For all musical abilities or even non-musicians, writers or poets.  Our songwriting sessions are relaxed group meetings where we share ideas, thoughts and constructive discussions to help with music and/or lyric writing and structure. 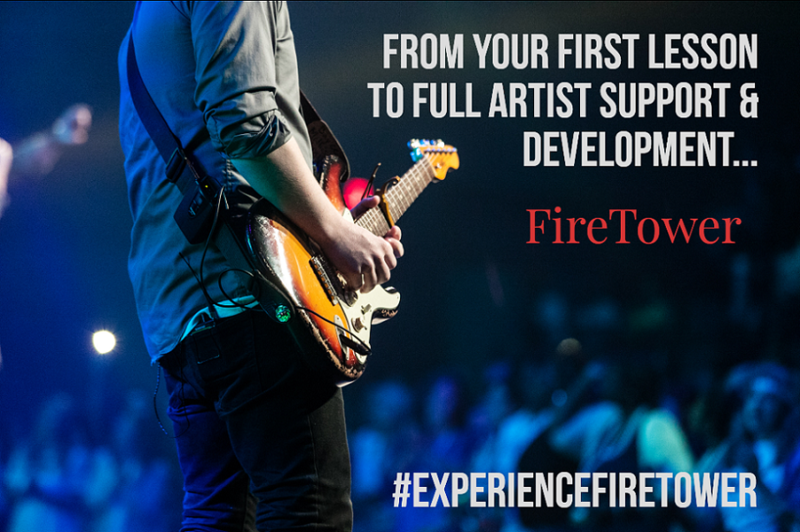 FireTower will organise regular group gigs and periodically use the recording facilities to produce albums as the group matures and embarks on different projects. 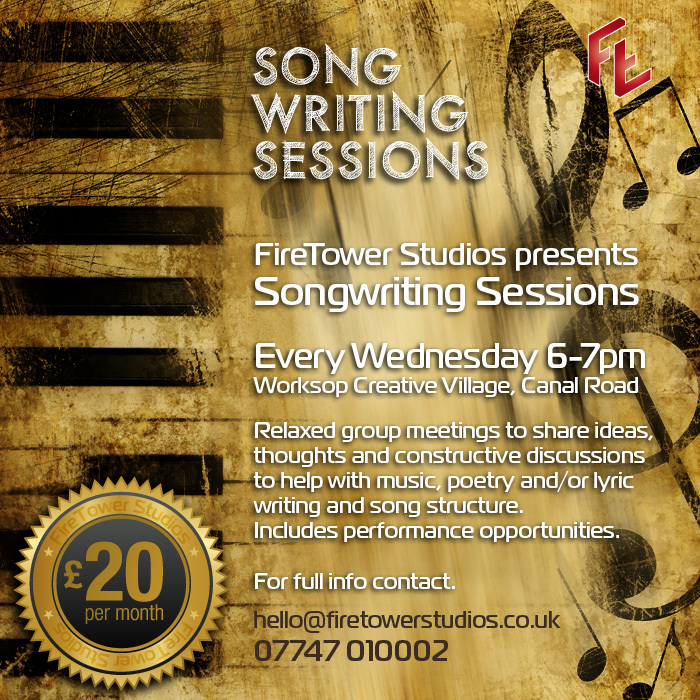 Our songwriting sessions are an hour and are held every Wednesday evening at 6pm at the Worksop Studio at the Worksop Creative Village.